This rubric provides a clear explanation to students about how to create responses to show their critical thinking. 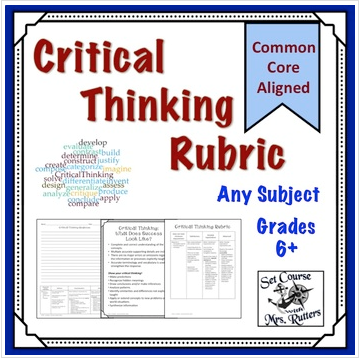 The rubric is formatted generally so you can use it with a variety of prompts and projects. Students should be thinking critically in all subjects, but providing clear guidelines and assessing those standards can be incredibly difficult. This rubric is designed to provide a consistent set of expectations that can be referred to with any subject or with any project. This rubric can be used in any subject area (Math, Reading, Science, Social Studies, STEM, Humanities, Art, Music, Foreign Languages, Physical Education, etc.) for any activity where students are expected to create something to show their critical thinking and understanding (reports, essays, multimedia presentations, slideshows, videos, skits, speeches, brochures, advertisements, games, picture books, magazine articles, posters, etc.). There is great flexibility in how you use the rubric to generate grades. It can be a useful formative assignment tool to provide feedback to students about how to improve their responses. It can be used with summative assessments to evaluate student understanding. CCSS.ELA-LITERACY.CCRA.W.2 - Write informative/explanatory texts to examine and convey complex ideas and information clearly and accurately through the effective selection, organization, and analysis of content.